It’s always interesting when something mysterious washes up on the beach. Just last week both a gigantic eye, as well as a sinister deep-sea creature made national headlines when they were found along the shore. This phenomena has occurred for years, and speaks both to our fascination with the world of the deep, and our delight when that world comes into contact with our own. From sea monsters, to messages in bottles, to Ambergris, our oceans contain many wonders. Yet, for every public interest news story set on a beach, with a confused local holding up something strange, there are ten saltwater-drenched items that the media and government have not disclosed to the public. But Crunchyface will. Right now. 1) The Body of James Cameron–Found after having obviously been spear-gunned through his head, it’s suspected that the Titanic director was murdered by marine biologists, angry by Cameron’s continued attempts to infiltrate their profession. 2) Nemo’s Father, Marlin–Unfortunately, when Marlin got a bit older, and became confused from time to time, Nemo wasn’t around to find him. 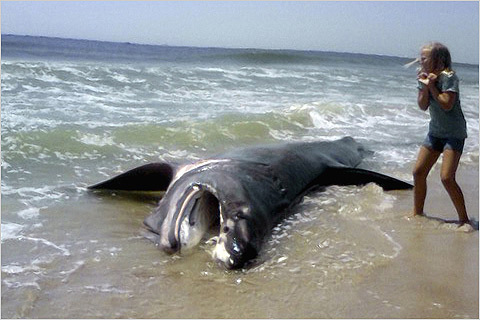 He accidentally beached himself in 2009, though some fish think it may have been a mercy beaching. 3) Bin Laden’s Beard–Discovered by a primitive tribe in New Guinea, it was last seen being used, unsuccessfully, as a fishing net. 5) Sully’s Syringe–A few days after the emergency landing of US Airways Flight 1549, orchestrated in 2009 by Captain Chesley “Sully” Sullenberger, a mysterious syringe was found washed up on a New Jersey beach. Extensive forensic testing connected it to both the plane and Sullenberger. It also confirmed the presence of steroids. It seems that Sully was using performance enhancing drugs when he landed that plane. Another one of our heroes…gone. 6) The Remnants of Pearl Harbor–Not from the actual attack, but rather, unsold copies of the DVD from the 2001 film. Scientists speculate that during a recent flood, one of our nation’s many “Pearl Harbor Landfills” broke free from the earth, and the videos made their way out to sea. 7) The Crown of the King of Atlantis–Given as a gift to a Rastafarian pimp, by a Kingston-area prostitute who found it on the beach. 9) Diplomatic Shark–For three days he attempted to negotiate for peace, explaining that many of his ilk were upset by their portrayal in our media. Eventually, he made his way back into the ocean and swam off, unsatisfied. 10) Part of One-Eyed Willie’s Treasure–Just after the town of Astoria inexplicably allowed The Inferno to drift out to sea, laden with a billion dollars worth of treasure (just the rubies in Mikey’s marble bag were worth enough to save their entire neighborhood–so extrapolate from there), it was quickly intercepted by a Japanese whaling boat. During the attempt to board, one of Willie’s booby traps sank his ship and all its contents. Some items have recently started washing ashore in southern Asia.